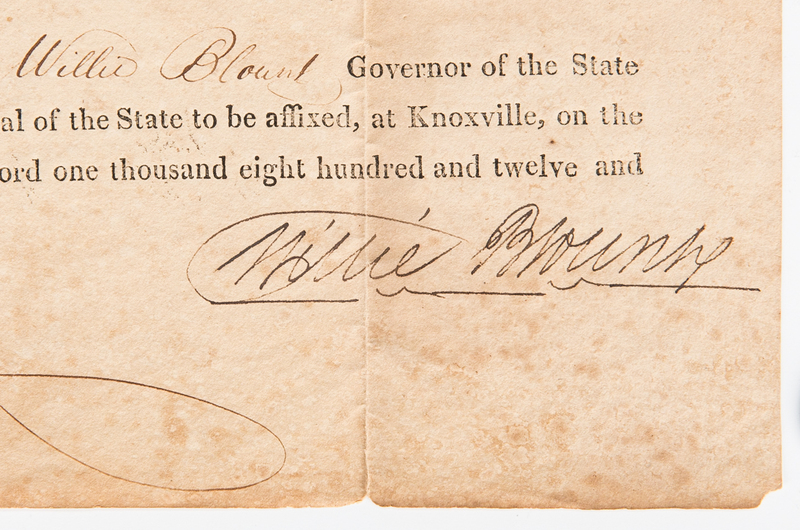 One (1) Willie Blount Tennessee Governor Signed Land Grant, and three (3) "Acts of Tennessee" books, including 1861, 1881, 1895, 4 items total. 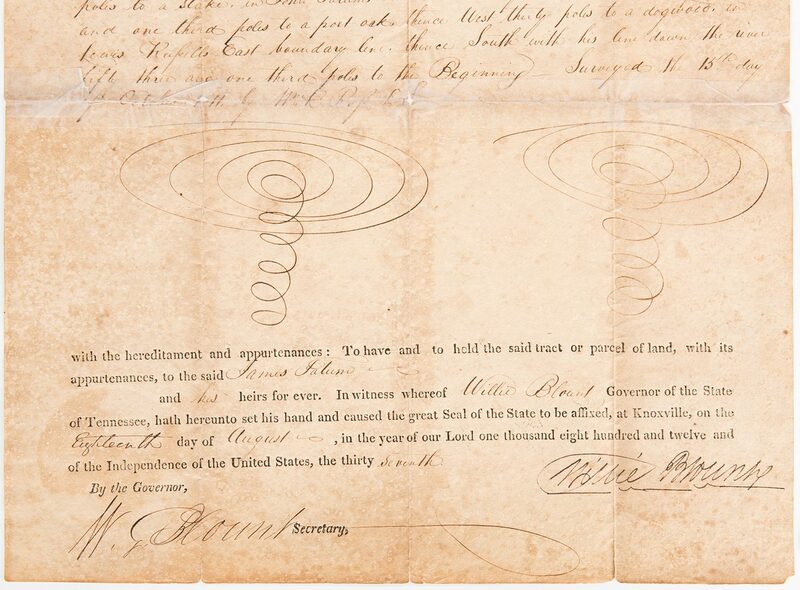 1st item: Governor of Tennessee Willie Blount (1768-1835) and Secretary William Grainger Blount (1784-1827) signed land document, No. 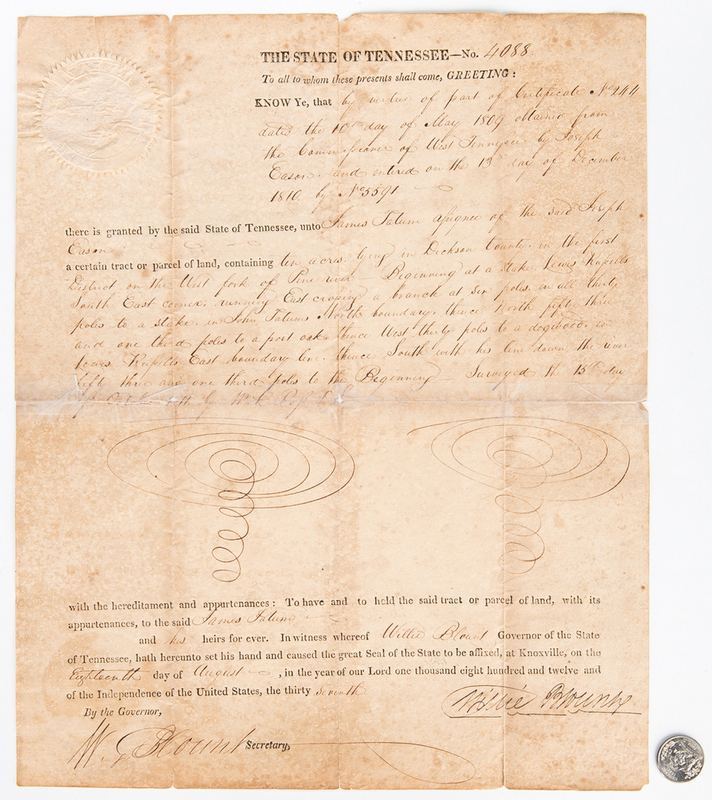 4008, granting James Tatum assignee of the Joseph Eaton "ten acres lying in Dickson County, in the first District on the West fork of the Pine river–Beginning at a stake. 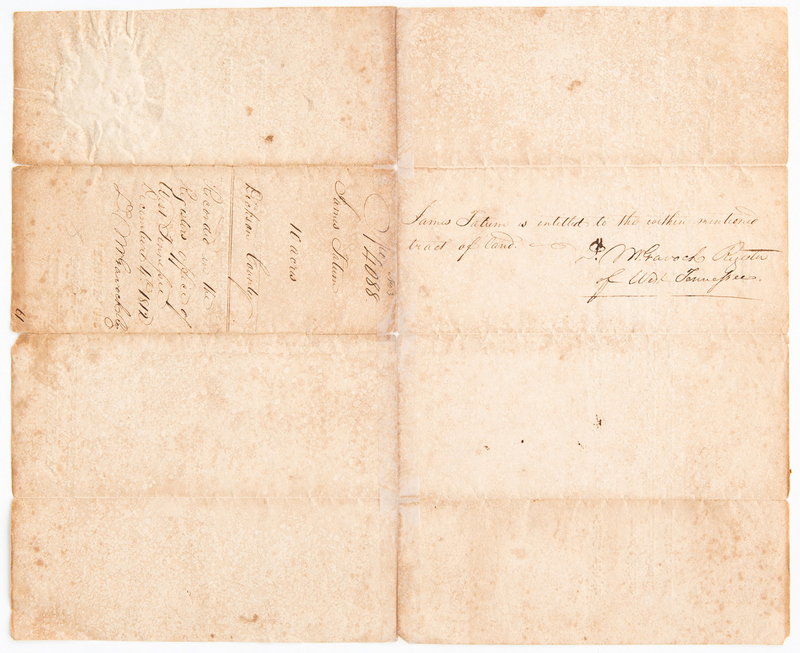 Lewis Kapells South East corner, running East-croping [sic] a branch at six poles, in all thirty poles to a stake, in John Tatums North Boundary…" dated August 18, 1812. 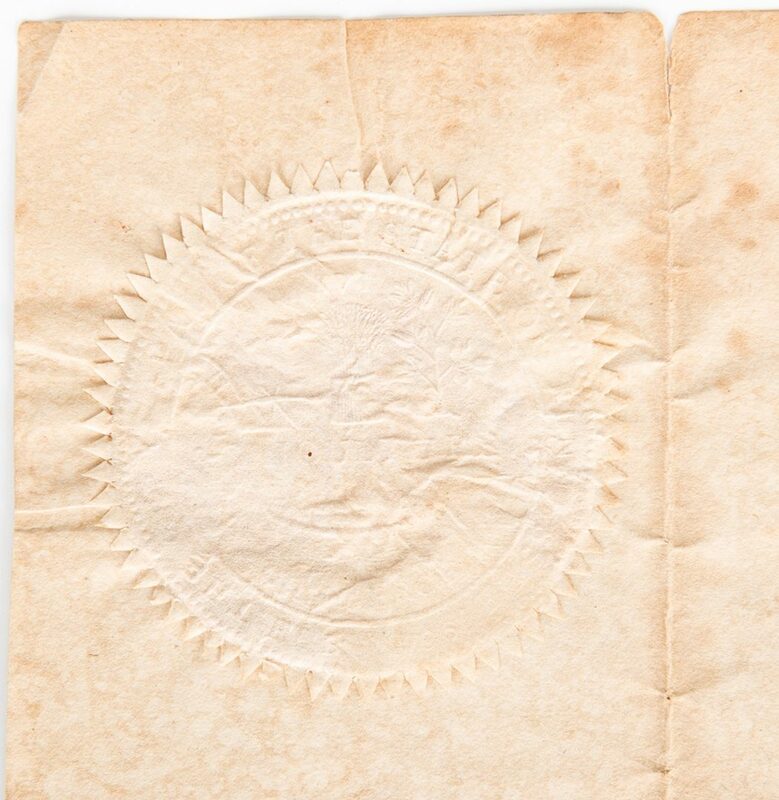 15 1/2" H x 12 5/8" W. Early 19th century. 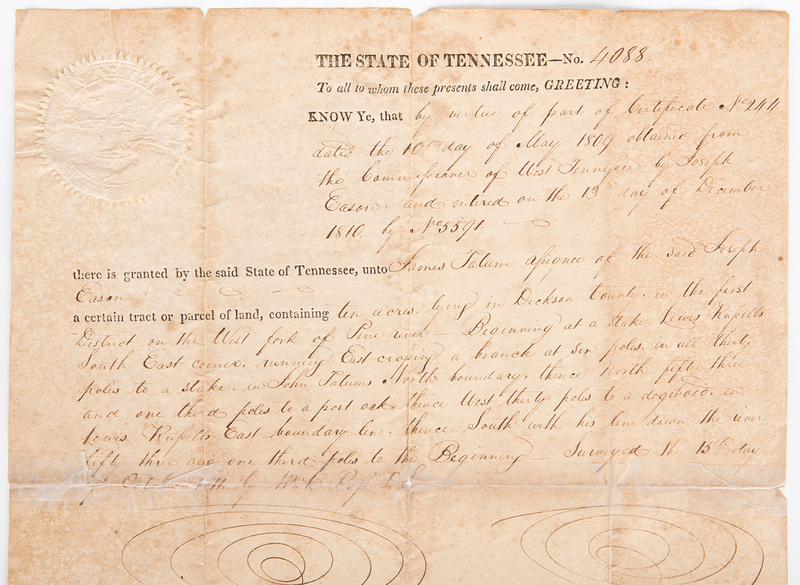 Note: William Grainger Blount was the eldest son of William Blount, nephew of Governor Willie Blount. 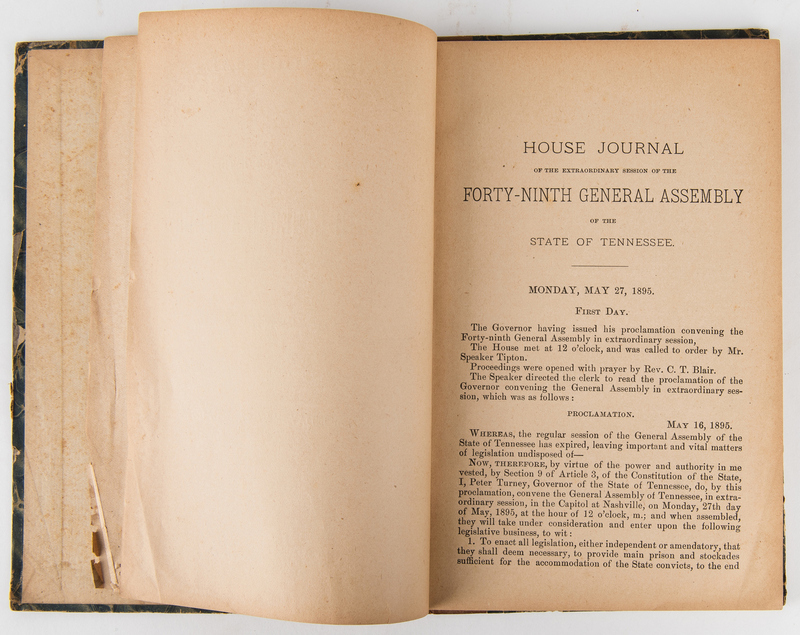 He practiced law in Knoxville and became the owner of Blount Mansion after serving three terms in the Tennessee House of Representatives. 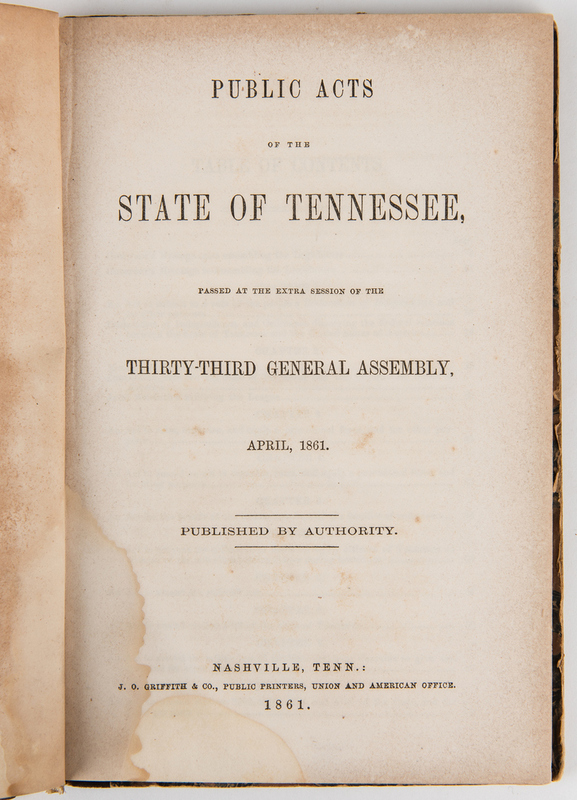 2nd item: Public Acts of the State of Tennessee, Passed at the Extra Session of the Thirty-Third General Assembly, April 1861. 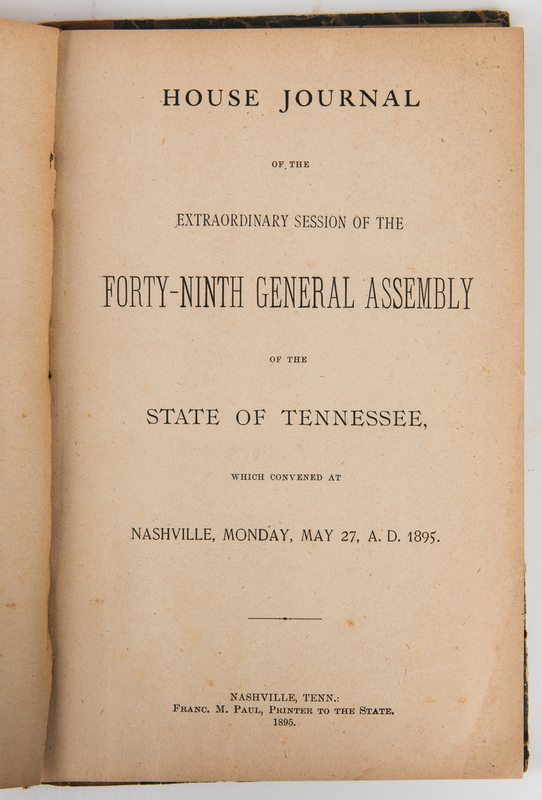 Printed by J. O. Griffith and Company, Public Printers, Union and American Office, Nashville. 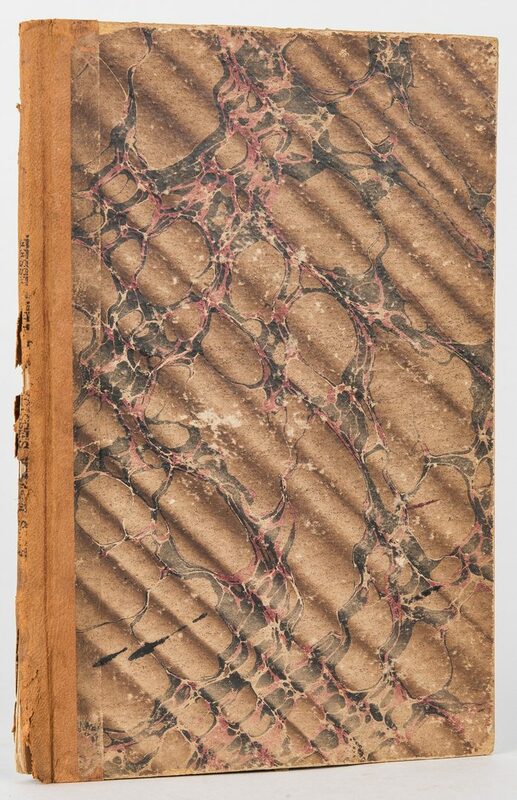 Octavo, 103 pages, hardbound in one quarter brown cloth with marbled paper sides, pencil inscriptions, to front end paper. 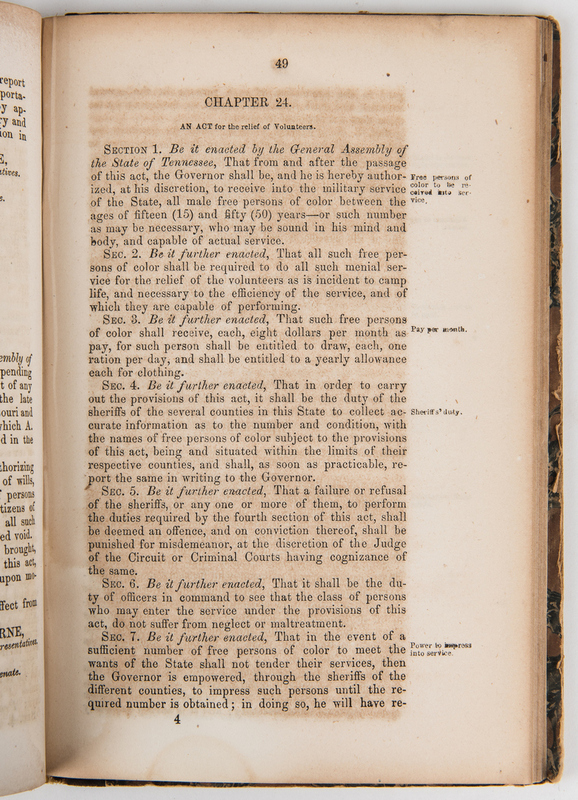 8 5/8" H x 6" W x 5/8" D. Mid 19th century. 3rd item: Acts of the State of Tennessee, Passed by the First Extraordinary Session of the General Assembly, 1881, 1882. Published by Albert B. Tavel, Nashville. 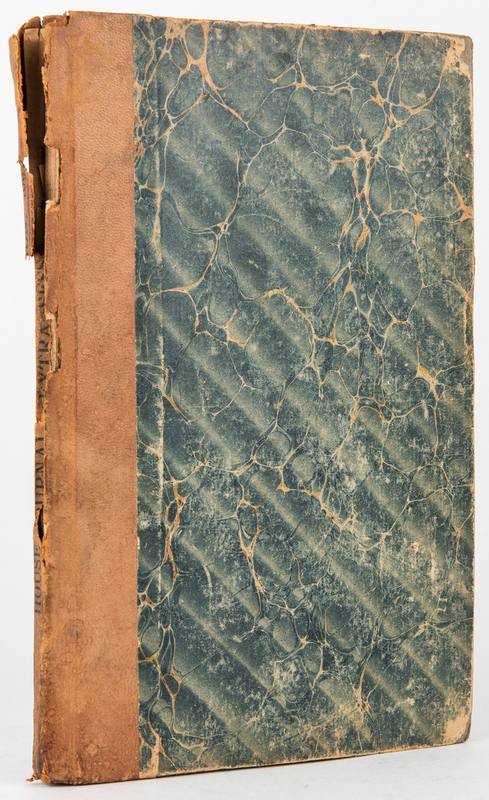 Octavo, 33 pages with index, hardbound in one quarter brown leather with marbled paper sides, black lettering to spine, pencil inscriptions from previous owner, to back end paper. 8 5/8" H x 6" W x 1/4" D. Late 19th century. 4th item: House Journal of the Extraordinary Session of the Forty-Ninth General Assembly of the State of Tennessee, which convened at Nashville, Monday, May 27, A.D. 1895. 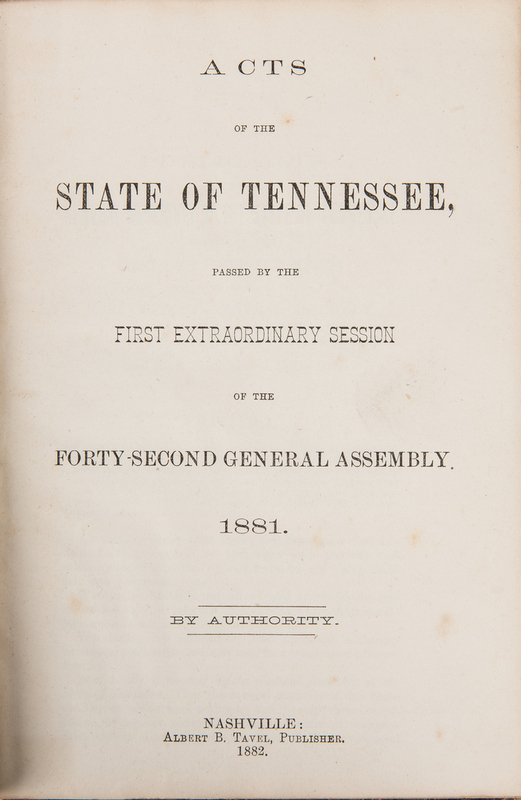 Printed by Franc M. Paul Printer to the State, Nashville. 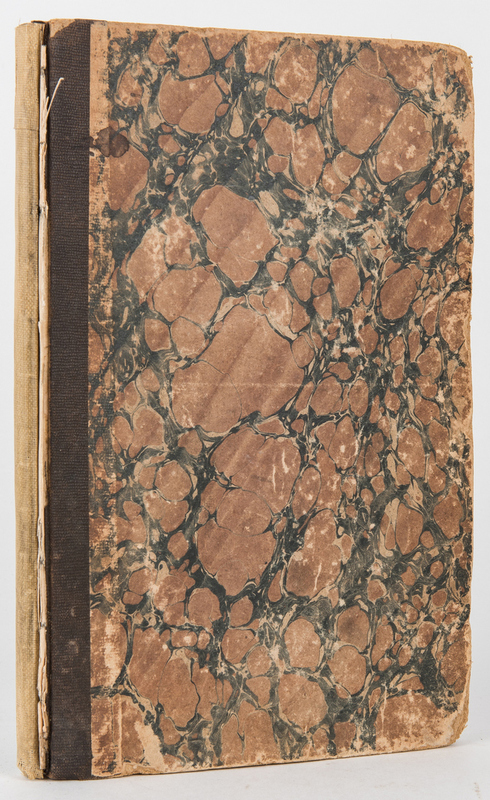 Octavo, 160 pages, hardbound in one quarter brown leather with marbled paper sides, black lettering to spine, ink inscription from previous owner, to front end paper. 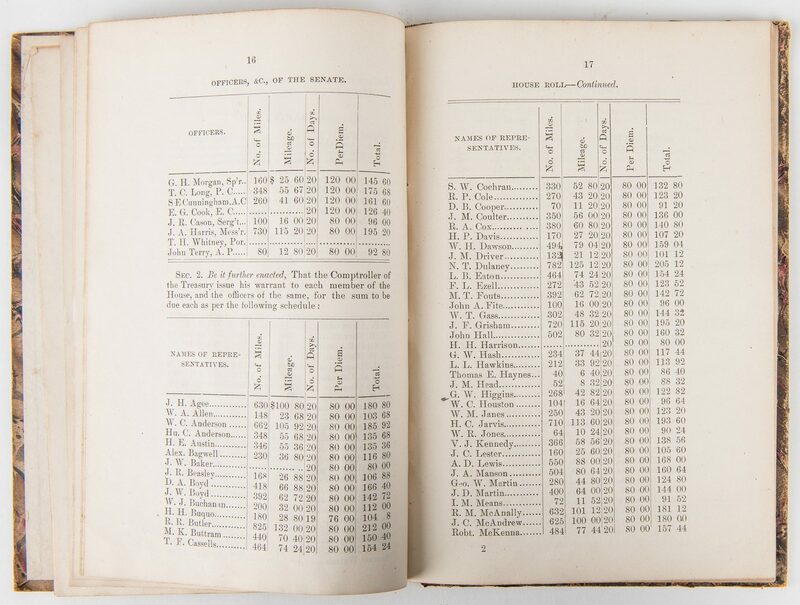 9" H x 5 7/8" W x 3/8" D. Late 19th century. 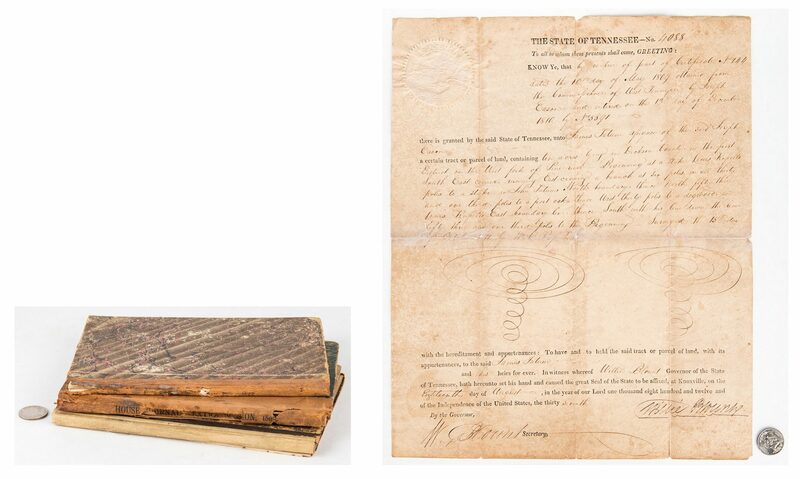 CONDITION: 1st item: Foxing spots, acid burning, dampstaining, toning, tears, largest 1 1/2" to be expected from age. 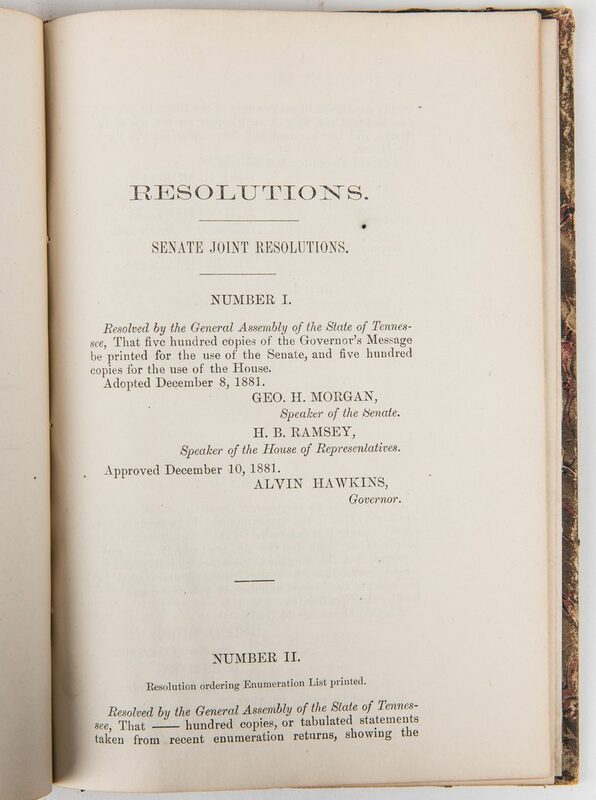 Scotch tape repairs across width of center fold line. 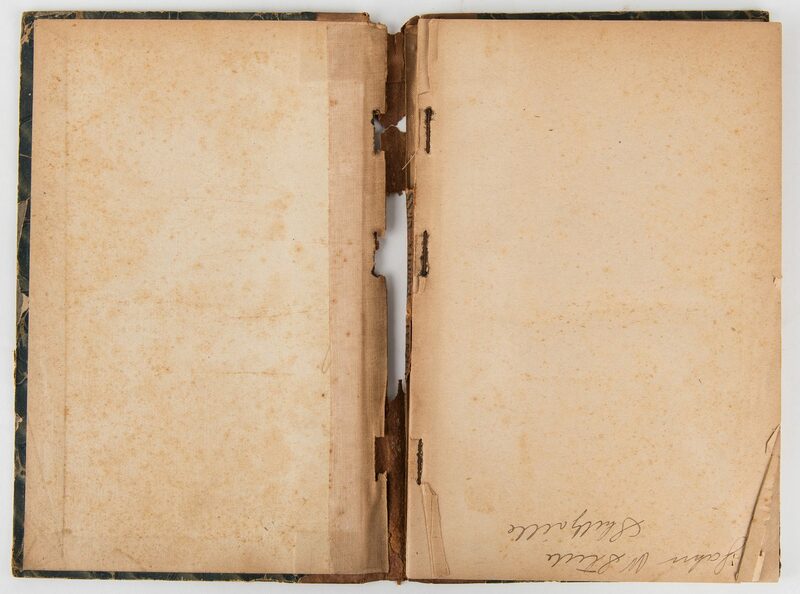 2nd item: Covers in worn condition, front cover separated from spine, spine covers in old archival tape, corners bumped. 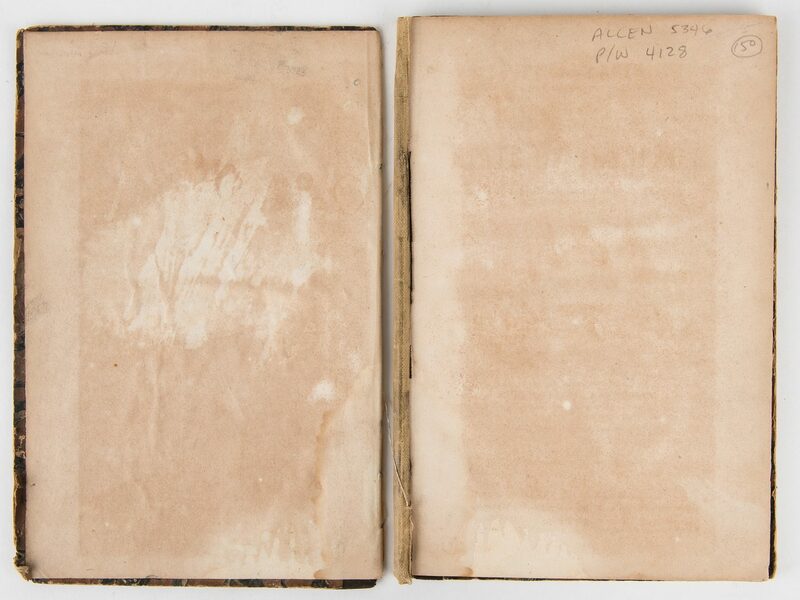 Pages with foxing spots, areas of dampstaining, tears, toning, etc. to be expected from age. Old scotch tape repair across width of back end paper. Pencil inscriptions, to front end paper. 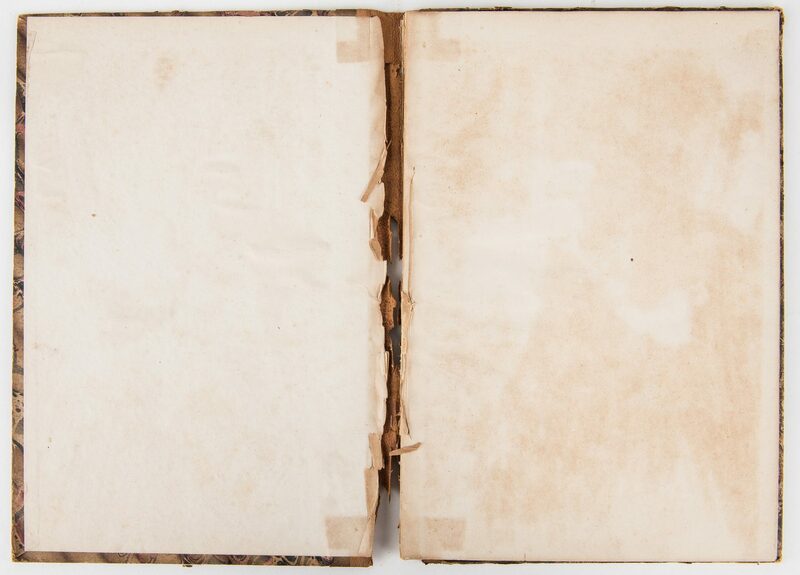 3rd item: Covers in worn condition, almost separated from spine, covers bumped. 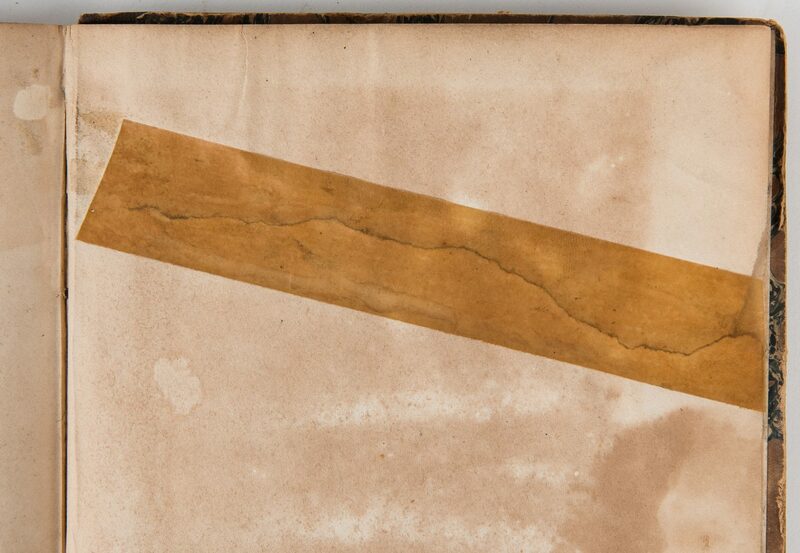 Pages with foxing spots, areas of dampstaining, tears, toning, etc. to be expected from age. Pencil inscriptions from previous owner, to back end paper. 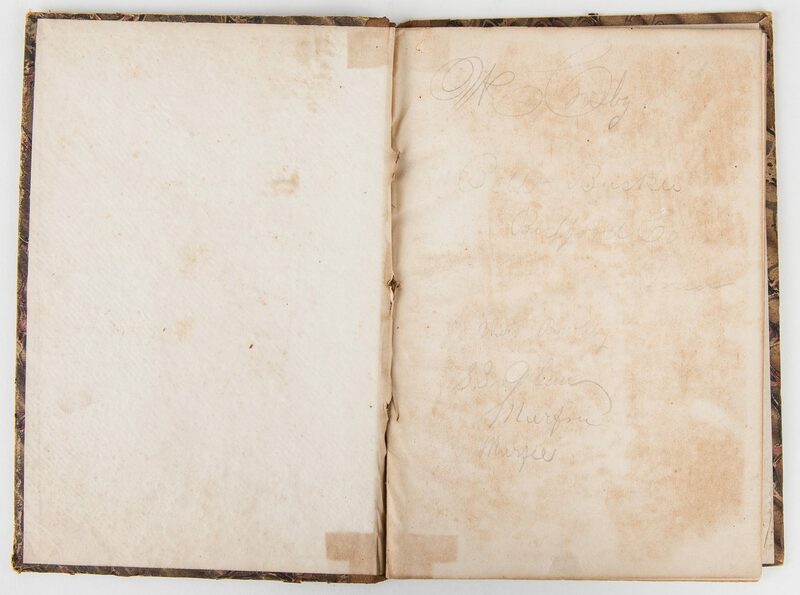 4th item: Covers in worn condition, almost separated from spine, covers bumped. 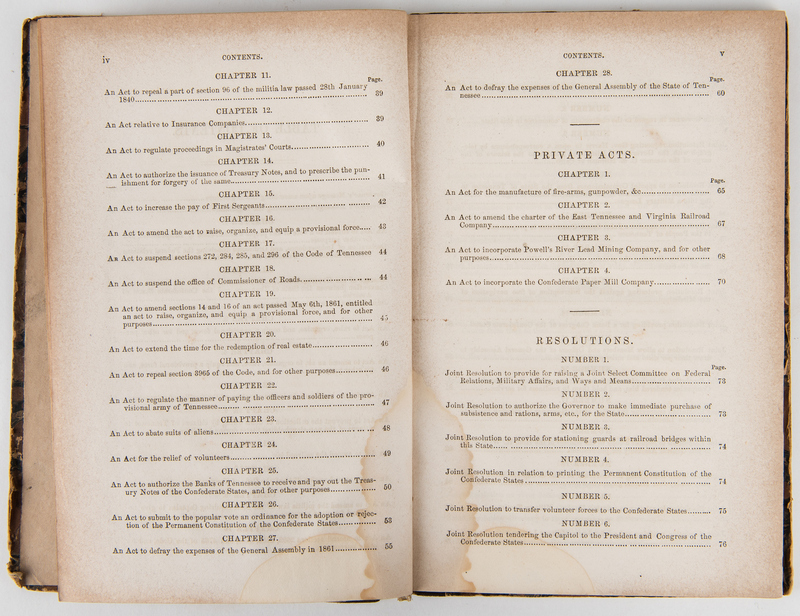 Pages with foxing spots, areas of dampstaining, tears, toning, etc. to be expected from age. 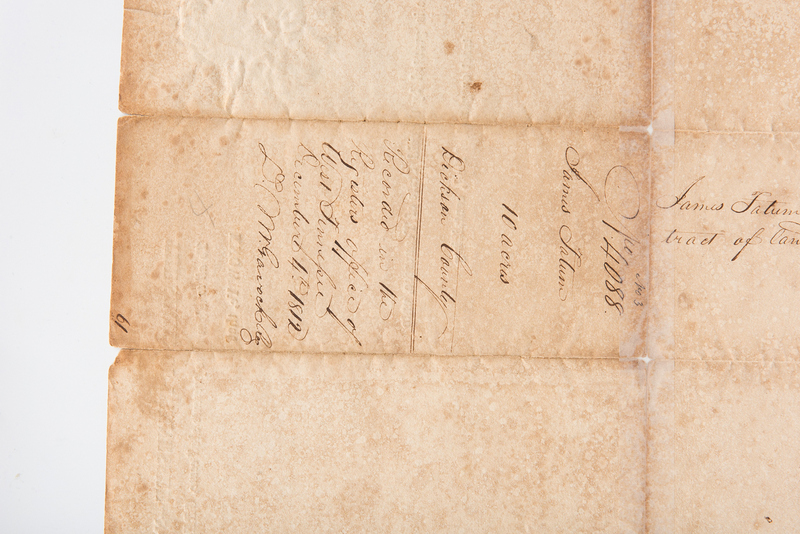 Ink inscription from previous owner, to front end paper.